Escape the city for a relaxing full-day tour to the Sapadere canyon from Side, including lunch and a 1-hour stop-off in Alanya. 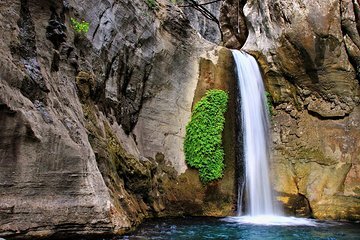 Hidden away in the Taurus Mountains, the Sapadere canyon is an idyllic retreat and you’ll have ample time to walk through the canyon, explore the Guceler cave and swim beneath the falls. Great tour with some beautiful views. Would deffo recommend to those traveling to or around side. The tour was in mainly German but the tour Gide ensured that we left out and tried to translate in English where possible.